Dr. H. Anil Kumar has a doctoral degree in Library and Information Science from the M.S. University of Baroda, India and the Master's and Bachelor's degree in Library and Information Science from Bangalore University. He secured gold medals in both Master's and Bachelor's programmes of Library and Information Science. With more than two decades of professional experience at renowned academic institutions like National Law School of India University, British Library and Entrepreneurship Development Institute of India, Nirma University, etc. He was invited under the prestigious International Visitor Programme of the Department of State, United States of America in June 2001. He is the recipient of Outstanding Librarian Award 2012 by AIMS (Association of Indian Management Scholars), Asian Professional Award (2011) by Special Libraries Association (SLA), USA and Best Librarian Award (2008) by Management and Libraries Network (MANLIBNET), India. He is a former member on the Editorial Board of Vikalpa (a journal of IIMA), Chairman of the Editorial Advisory Committee of the Journal of Library Management and Member of Editorial Board of the International Journal of Information Dissemination and Technology. Dr. Anil Kumar conducts a very successful training programme for publishers titled as "Managing for the future" at the Indian Institute of Management Ahmedabad since 2011 and is a faculty in MDPs like Innovating for Excellence at IIMA. He is the former President of Management Libraries Network (MANLIBNET) India and founding member of the International Centre for Technology and Entrepreneurship (www.icreate.org.in). He has five books and thirteen papers to his credit. He has been invited to present papers in national and international conferences. His areas of professional interest are: Emerging Technology and Management Trends in Librarianship. Ms. Hiral Patel is B.Sc, M.L.I.Sc, She has received 'Gold Medal' in her M.L.I.Sc. degree from Gujarat University, Ahmedabad. Ms. Hiral has rich professional experience of working in various institutes of national repute like Nirma University, CEPT, NID, British Library, Behavioral Science Center - St. Xavier's College. She has also attended so many National and International Seminars/Conference throughout her career. Mr. Muralidharan K. N. joined the Indian Institute of Management Ahmedabad in 1985 as a clerk. He did his B.Com from Shree Sahajanand Arts & Commerce College Ahmedabad and MLISc from IGNOU. On completion of his Masters in Library Information Science he had been promoted to the post of Professional Assistant and then to the post of Senior Professional Assistant. In January 2013 he was elevated to the post of Assistant Librarian. He has been working in the library since then in various sections like Reference & Information, Catalogue Section, Periodical Section and Books Acquisition Section. Presently he is looking after all the activities of the Periodicals/Serials, Online Resources, ILL & Reference,and Staff Management. Mr. Jignesh Amin is working as Senior Library Professional at Indian Institute of Management Ahmedabad since February 2008. Before joining IIM Ahmedabad he was working as Library Assistant in Institute of Management, Nirma University, and Consumer Education & Research Center. He has played a key role in developing Koha ILMS, Vikram Sarabhai Library website, 9th Annual Meet & Workshop of INDEST-AICTE Consortium website, National Information Centre on Management (NICMAN) website using Joomla and Library conference website using OCS. He also helped to develop Institutional repository with video archives of IIM Ahmedabad using DSpace. Currently, he is working in databases/eResources section. His primary assignments are related to the resources like evaluation, trial set up, organizing orientation, subscription/renewal, troubleshooting, guiding users, solving reference queries, observing usage and budgetary matters of the eResources. He has published seven papers/articles in journal/conferences/seminars. He has actively involved with professional bodies like ADINET, Gujarat Granthalaya Seva Sangh, Alumni Association and ADINET yuva. Awarded for Outstanding Performance at IIMA for the year 2011-12. Mr. Jignesh Amin has qualified UGC NET with subject Library and Information Science. Education: Ph.D (Pursuing); Master of Science and Master of Library & Information Science from Gujarat University. Mr. Mallikarjun Dora is presently working as Senior Library Professional at Vikram Sarabhai Library, Indian Institute of Management, Ahmedabad. Prior to this he has worked with Indian Institute of Management Kozhikode and Koustav Business School, Bhubaneswar.He has 15 research papers on his credit published in International and National Journal and Conferences. Mr. Mallikarjun Dora has qualified UGC NET-JRF with subject library and information science in 2005. Awarded for Outstanding Performance at IIMA for the year 2011-12, 2015-16 & 2017-18. He had worked as an Assistant Librarian for a brief period from September 2018 to March 2019 at IISER Berhampur. MANLIBNET Best Paper award for the year 2012. He is also involved in the administration of trainees. Mr. Viralkumar Navik is working as a Senior Library Professional at Vikram Sarabhai Library since February 2008. Before joining IIMA he was working as a Librarian at Navrachana Higher Secondary School, Vadodara. He is working in acquisition section. His main assignments are purchasing of books, CD, e-books and other materials, online books, classification and cataloging and budgetary matters of the acquisition section. He is also involved in the marketing of library services through co-coordinating Book Talks, Know Your Library Quiz and Social Media. He was awarded for Outstanding Performance at IIM Ahmedabad for the year 2014-15. Best PPT Presentation Award at ETBL (Global Conference on Emerging Trends in Business Leadership) for the year 2015. Ms. Asha Desai is working as a Senior Library Professional at Vikram Sarabhai Library. She joined the institute in the year 2008 as a Professional Assistant (Library), before joining IIMA she was working as an assistant librarian at ICFAI Business School, Ahmadabad.At present, She is working in Print Resources Acquisition section. Her main assignments are to look after purchasing of print books, journals, managing suggestions and subscriptions, etc. Master of Commerce and Master of Library and Information Science from Gujarat University. Ms. Rina Patel working as a Senior Library Professional at Indian Institute of Management Ahmedabad since January 2008. She did M.Com & Master of Library and Information Science. Before joining IIM Ahmedabad she was working as Technical Assistant in All India Radio, Ahmedabad. Earlier she was in Publications Division where she developed Photo Library and first time made case studies available online on IIMA website. She is in Vikram Sarabhai Library since the October, 2013. At present, She is working in Library IT section. Her main assignments are to look after Library Website, Consortia Website, Koha, Institutional repository, RemoteXs, Video Wall, IIMA archive website and other library-related IT operations. Ms. Sajeda Momin is working as Professional Assistant (Library) at Indian Institute of Management Ahmedabad from September 2013. Before joining IIMA, she was working as Manager - Knowledge Centre in HCP Design Planning & Management Pvt. Ltd.
Mr. Jayaprakash Sivasamy is working as a Professional Assistant (Library) at Vikram Sarabhai Library since October 2013. Before joining IIM Ahmedabad he was working as library assistant at IIM Calcutta & KPR School of Business and Library intern at Indian School of Business. At present He is working in Book Acquisition section. Mr. Bhavesh Patel has completed B.E. (Computer Science) from HNGU, Gujarat and MBA (Operation Research) from IGNOU. He has joining IIM Ahmedabad as Professional Assistant (IT) since October, 2013. Mr. Bhavesh Patel started his career from IndiaNIC Info Tech Pvt. Ltd in 2007 as Sr. Web Developer. Before joining IIM Ahmedabad he was working with INFLIBNET Centre as Project Officer (CS). He is involved in the Technical activities related to Open Source Software and Library server. 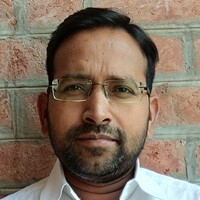 Presently he is involved in Institutional Repository, Web Development Area and other open source softwares related to library and information center. Awarded for Outstanding Performance at IIMA for the year 2015-16. He believes "Learning is a never ending process"
Mr. Bhaumikkumar Solanki is working as Professional Assistant (Library) at Indian Institute of Management Ahmedabad from November 2015. Previously he had worked with MICORE (MICA), SIEM and CPIFT. Education: B.com; Master of Library and Information Science (Gujarat University); UGC NET (Library and Information Science); "O" Level (NEILIT). Mr. Shekappa Bandi is working as a Professional Assistant at Vikram Sarabhai Library, Indian Institute of Management, Ahmedabad from 1 st July 2016. Prior to this he has worked with Tata Institute of Social Sciences (TISS), Mumbai and Rajeev Gandhi College of Management Studies, Navi Mumbai. He has a 7 years professional experience and 8 research papers on his credit published in International and National Conferences and Seminars. Mr. Shekappa Bandi has qualified UGC- KSET with subject library and information science in 2014. Areas of Interest: ICT Applications in Library, CMS, Open Source, Assistive Technology and User Services. Education: Master of Library and Information Science from Karnatak University, Dharwad (KUD) and Post Graduate Diploma in Digital Library and Information Management (PGDLIM) From TISS. Ms. Vaidegi Dhamodharan working as a Professional Assistant at Vikram Sarabhai Library, Indian Institute of Management, Ahmedabad since 15th March, 2017. She started her career as librarian at Sabari College of Nursing, Pondicherry. Prior to joining IIMA, she worked as an intern at Indian School of Business. Education: Master of Library and Information Science (MLIS) and Post Graduate Diploma in Library Automation Networking (PGDLAN) from Pondicherry Central University. Mr. Panduranga Swamy is working as a Professional Assistant at Vikram Sarabhai Library, Indian Institute of Management, Ahmedabad from 1st May 2017. Master of Philosophy (MPhil) in Library and Information Science from Sri Krishnadevaraya University (SKD), Anantapur. Master in Library and Information Science from Sri Venkateswara University (SVU), Tirupati. Masters in Economics (M.A.) Economics from Madurai Kamaraj University (MKU), from Madurai. Mr. Panduranga Swamy has qualified UGC- APSET with subject library and information science in 2016. Library and Documentation Facility, SDSC-SHAR, Indian Space Research Organisation (ISRO) Sriharikota, A.P. He has a 12 years professional experience and o6 publication in journals and 12 research papers on his credit published in International and National Conferences and Seminars. ICT Applications in Library, Library collection and User Services. Ms. Sandhya is working as Office Assistant at Vikram Sarabhai Library. She joined IIMA in March 2007. She is working as Secretary-Librarian since November 2017. She is responsible for assisting the Librarian in all the administrative work of the library, correspondence and coordination with various departments of the institute. She assists the Librarian in organizing various Conferences, Workshops or Meetings.